Coolaroo is an Aboriginal word for 'star'. The popular 1997 Australian film The Castle was set in Coolaroo, although the house featured was actually located in Strathmore. Coolaroo railway station opened to passengers on Sunday 6 June 2010, almost 40 years after plans for a station first surfaced. In the 2016 Census, there were 3,191 people in Coolaroo. 51.7% of people were born in Australia. The next most common countries of birth were Iraq 9.2%, Turkey 5.5% and Lebanon 3.8%. 37.9% of people spoke only English at home. Other languages spoken at home included Arabic 14.4%, Turkish 11.8% and Assyrian Neo-Aramaic 8.1%, The most common responses for religion were Islam 28.8%, Catholic 23.2% and No Religion 14.4%. Most of the shopping centres near Coolaroo are located in neighbouring suburbs, including Meadow Heights which has Centro Meadow Heights and Dallas Shopping Centre, to the south. ^ a b Australian Bureau of Statistics (27 June 2017). "Coolaroo (State Suburb)". 2016 Census QuickStats. Retrieved 3 July 2017. 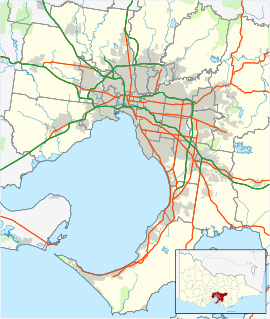 ^ "More peak hour services for Melbourne's south east". Media Release: Minister for Public Transport. 28 April 2010. Retrieved 28 April 2010. This page was last edited on 19 November 2018, at 06:16 (UTC).